French Emblems: Emblem: Amoris ingenui tormentum. The torment of noble love. Insilit culex protervus, ac necat se. Persequens, crucem invenit, suumque funus. Look how the bold midge darts at the fiery light of the gleaming torch, and kills itself. Just so the wretched Lover, chasing his flame, finds his torment and his death. Arva sicca nimbus intrat, ite laeti. Pyraustae inertem pertimeo necem nimis. A trochaic Sotadic trimeter monocolon, like the one in Marius Servius: “The cloud comes upon the dry field; go on your way rejoicing”. The midge is an insect that is astonishingly enthralled by the brightness of a flame: to the extent that it flies up to lanterns and swiftly falls, having burnt its wings, and dies. For this reason the ecstatic death of the Pyrausta has become proverbial. It is not unlike the condition of the lover, who, unsatisfied in his love, reaps the harvest of his boldness, and perishes in the fire of love for which he is dying: to which the hexameter of Aeschylus the tragic poet refers: ‘I fear too much the lifeless death of the Pyrausta.’ Modest love can run into this disaster too, since we read that Evadne, from too great a [p.141] love of her husband Capaneus, voluntarily flung herself onto his burning pyre; and that Portia, that unique ornament to proper love, on the death of her husband Brutus, having taken in the sight of his burning pyre, took her own life (for which Valerius Maximus is our source). 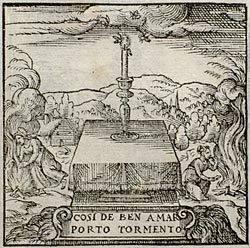 For Dido, taking her own life with a sword, certainly bequeathed an ambiguous example in both respects: so that the following little line of Petrarch in Italian could be inscribed in the picture, which is in other respects self-explanatory: “COSI DI BEN’ AMAR, PORTO TORMENTO” (Thus I from loving well endure distress). 1. Sotades was a Greek poet of obscene verses. For Servius Maurus (not Marius) Honoratus, see emblem VI ([FJUb006]). 2. Pyrausta, or in Greek πυραύστης, was a mythical insect believed to live in fire (see Lewis & Short, s.v. ‘pyralis’; Pliny, Natural History, 11.36.42.119; 10.74.95.204). Junius seems to be using it simply to mean a moth that dies in the fire. 3. Capaneus, one of the ‘Seven before Thebes’, he was struck down by a thunderbolt from Jupiter for boasting, and his wife Evadne threw herself into the flames (Apollodorus, 3.7.1). 4. More correctly, Porcia, Cato’s daughter. 5. The early imperial historian.